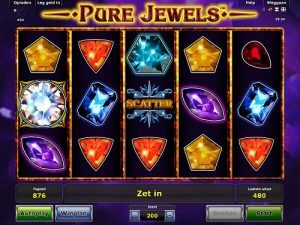 The slot game, Pure Jewels slot game, brought to you by NovomaticCasino.co.uk, shines bright like a diamond in a sea of zircon slots. Everything about it glitters and sparkles and dazzles you with its diamond delights. It’s a simple slot but very popular amongst regular players as it’s lucrative and enjoyable. The symbols are colourful and bright, the soundtrack is unique and there are some special features which make this slot so intriguing. You don’t need to go digging down any sort of mine to find treasure or jewels with this slot! Just spin the reels and watch as the wins come to you and make your balance rise! In Pure Jewels slot game, as the name suggests, all of the symbols are glittering gemstones! They’re all different shapes, sizes and colours! From the lowest-paying symbol to the highest paying symbol, there is the teardrop ruby, the heart-shaped pink gem, the triangular orange gem, the pentagonal yellow jewel, the rectangular blue sapphire, the marquise purple gem, the trilliant emerald, the hexagonal blue gem and the dazzling, round diamond! The aim of the game is to spin three or more matching gemstone symbols on a winline, in consecutive reels from left to right. The size of the payouts will depend on the gem and your bet amount, which you can increase or decrease using the plus and minus symbols to either side of it. Check the paytable to see how much each winning combinations of jewels will pay you and alter your bet if you wish. Although this 5-reel slot might seem simple at first glance, it actually has a pretty cool feature and fans of Jewel Action, Just Jewels Deluxe and Fruit Fall will absolutely love it! The reels in Pure Jewels slot game are cascading reels, which helps to get you big wins! This means that each time you spin the reels and the symbols land in winning combinations, the winning symbols will disappear and other symbols will cascade down in their place. It’s positively a gemstone waterfall! This means that you almost get free spins after wins, as winning symbols will keep on disappearing and new symbols will fall into their place until no more winning combinations fall. Gems and jewels could be falling forever! Although the cascade feature in Pure Jewels slot game isn’t that common, there are some standard features in this slot game which regular players are sure to appreciate. The most lucrative is the gamble feature, which allows you to turn small wins into big ones! It’s a 50/50 chance gamble feature where you can potentially, endlessly double your wins if you keep on choosing the correct colour of the next card: red or black! The only time you can’t gamble your wins is if you’re playing in ‘autoplay’ mode – in this mode, the reels spin automatically so you don’t have to lift a finger, and your wins are automatically added to your balance straightaway. Dig deeper into the mine of NovomaticCasino.co.uk and see what else we have to offer! Aside from our extensive selection of slot games, we also have table games and live dealer games. Come and play in our live casino, at a real table with a real dealer! Load up Live Blackjack, Live Roulette, Live Poker or Live Baccarat and transport yourself directly into the heart of Vegas, without leaving your own living room!